Although you don’t use water in the attic, the space above your living space is an area very vulnerable to water damage. And since the area is not accessed often, attic problems have a long time to progress and develop. Over time your home may need roof repair, replacement of attic beams, removal of ruined insulation, repair of damaged sheetrock in ceilings below, replacement of carpet, and mold remediation to remove toxic contamination inside the attic. An unexpected hazard from water damage is the chance of an attic fire. If your electrical wiring is present in an attic or ceiling, moisture could pose a fire threat from shorted wires. Here are the most common causes of water damage from the attic, and how to prevent expensive damage. Roofing leaks can develop for a variety of reasons: improper roof installation, wind or storm damage, and lack of maintenance. Chronic roof leaks lead to wood deterioration and rotten roof framing which require assistance from a professional contractor. You can also face expensive wood framing repairs if water leaks down into ceiling joists and walls. Within the home, a serious leak can damage the interior ceiling. Affected ceiling paint will darken and ceiling plaster may bubble and expand. The leaking water also will damage paint and plaster on nearby walls. You might have damage on ceiling-mounted lights and furnishings below the leak. Since roofs have a life of 20-30 years, it is important to maintain and replace as needed. Ceiling stains can also be caused by moisture already inside the house. Many areas of your home continuously have excess humidity or condensation. Damp rooms, such as bathrooms, laundry rooms, and kitchens, can lead to mold- and mildew-stained ceilings. Install proper ventilation and using a dehumidifier, if necessary. When installing exhaust fans, make sure the duct to the attic space is properly insulated and vented to the outside of your home and not to your attic space. Be certain that you have adequate ventilation installed in the attic. 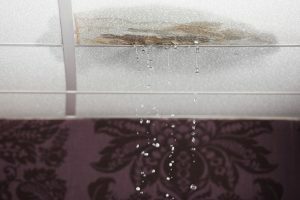 Mold can spread throughout the home’s structure, to the HVAC system and then to the rest of the house through the vents where it can invade carpets, furniture, and even clothing. In most homes, vents are installed along the peak of the roof. Make sure these and the soffit vents are unobstructed to optimize passive air circulation. If condensation issues persist, consider adding a powered vent fan at the roof peak. Periodically, check attic air conditioners, swamp coolers, and HVAC (heating, ventilating, and cooling) systems. In some homes, the water heater is installed in the attic. Flushing the water heater tank regularly per manufacturer’s instructions reduces chances of attic water damage due to tank corrosion and leakage. Where the central A/C air handler is mounted in the attic, a clogged condensate drain line may trigger an overflow. An overflow safety switch can be installed to automatically shut down the unit before water damage occurs. Attic pipes must be well insulated as they are very susceptible to freezing and bursting in cold temperatures. During cold seasons, the attic should be five to ten degrees warmer than the outside air to prevent ice from forming on the roof. Insulate all exposed attic pipes to prevent freezing. Consider low-temperature detectors that send potential freeze alerts to your smartphone. If you experience water damage, call CleanMasters for help. They use infrared thermal imaging to locate all hidden sources of moisture and will perform a thorough extraction to remove all standing water. Clean Masters will also coordinate with your insurance company so that you don’t have to waste precious time calling your insurance company. They work closely with your insurance company, and their processes, in order to make the water removal process as painless as possible for you. Clean Masters approaches each water damage project by maximizing the existing resources and providing the proper level of external services needed. Cleanmaster’s services range from daily equipment rental to emergency water removal and full content drying. For water damage restoration in North Charleston, contact Clean Masters today at (843) 972-3555.